Paul Colombini (Chintan Environmental Research and Action Group): Paul graduated from the University of Maryland at College Park with a BA in art history and a BS in international business. He also taught English abroad for several years, first in Japan and then in China. At the time of his fellowship, Paul was studying for a Masters in international development at The American University in Washington, DC. 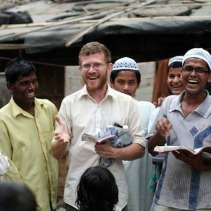 After his fellowship, Paul wrote: "This experience helped me understand India and Indian society and also gave me a greater appreciation of the enormous difficulties of development and grassroots efforts in particular."